Rating: 3.7/10. From 21 votes. Summary: The description, specs, photos, pricing and user ratings for the Auto-Ordnance 1911PKZMA pistol. 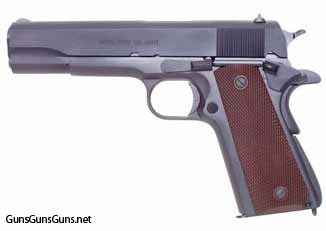 The Auto-Ordnance 1911PKZMA is a WWII-style 1911 pistol chambered in .45 ACP. 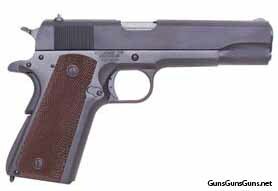 It features brown, checkered, plastic grips (model 1911PKZSEWMA features brown wood grips). It also includes a notch machined into the top of the barrel hood to act as a loaded chamber indicator, which makes it Massachusetts-compliant. .45 ACP 7+1 8.5″ 5″ 39 oz. This entry was posted in .45 ACP, $501-$750, 1911, Auto-Ordnance, Full size, Semiauto on October 2, 2012 by Staff.